This 4CD set contains the complete keyboard music by Domenico Alberti, a First Recording! Domenico Alberti lived a short but very productive life, from 1710 to 1740. He was famous as a composer, cembalo player and singer (the world famous castrato Farinelli heard him sing, and recognised in him a fearful rival). Alberti's claim to fame is his 'discovery' of the so‐called Alberti‐bass: the accompanying left hand chord broken in a certain way (like c‐g‐e‐g etc). This figure forms the basis of the Viennese classical style, and was used by all composers of keyboard sonatas and sonatinas. Alberti�s Sonatas and Toccatas are in two movements, the first an allegro in free form, followed by a mellow andante in arioso style. 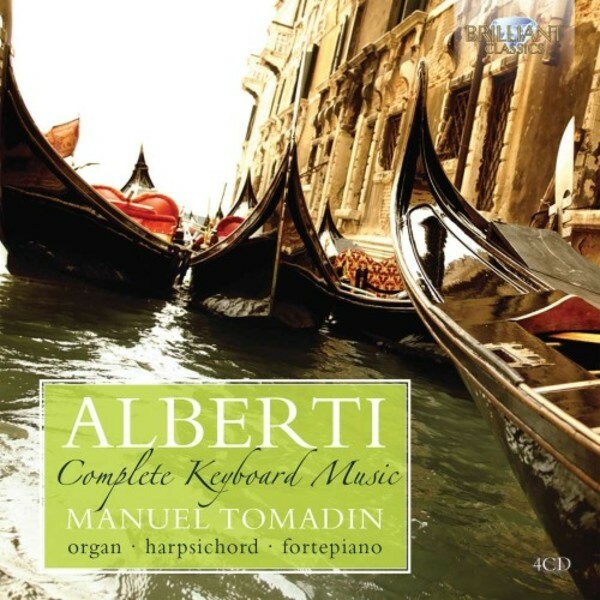 In order to achieve maximum variety, Manuel Tomadin performs these works on three instruments: an historic organ (1773 Francesco Dacci organ), a harpsichord and a fortepiano. Manuel Tomadin has already recorded successfully for Brilliant Classics, notably the Leipziger Chorale by Bach (BC94456).